Patrick Sylvestre, 36 of Spring Valley was arrested by the Orangetown Police on Friday for Burglary in the 2nd degree, Criminal Mischief in the 3rd, Menacing in the 2nd and Criminal Possession of a Weapon. Police responded to the area of the Rockland Garden Apartments on a call of an unwanted subject. Upon arrival, the officers observed Sylvestre running into an apartment that had its front door damaged. After investigation, it was alleged that that Sylvestre was the one who kicked down the door of the woman’s apartment and endangered two occupants inside the apartment with a knife. Sylvestre was arrested and sent to headquarters where he will be placed on $2,500 bail. He will appear in Nyack Justice Court at a later date. 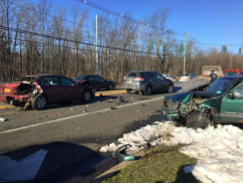 Last Thursday afternoon, Ramapo Police arrested a 30 year-old female driver after she was involved in an accident on Route 45. Investigation determined she was driving while under the influence of narcotics. The female was driving a green Jeep Cherokee at high speeds when she rear-ended another vehicle. The injuries were minor but the driver was arrested for DWI Drugs, Criminal Possession of a Controlled Substance and Criminal Possession of a Hypodermic Needle. Early Tuesday morning, a 26 year-old man from Sloatsburg was arrested for Petit Larceny. The suspect attempted to break into vehicles and steal items from inside. He was arrested and released but is expected to return to the Ramapo Justice Court to answer the charges. On Saturday afternoon, the Clarkstown Police arrested Sherman Winston (60 years old of Newark, New Jersey) for Criminal Possession of a Forged Instrument. Police responded on a report of possible fraud at the CVS in Bardonia. The pharmacist on duty was given a prescription of Oxycodone by a customer that seemed to be false. The pharmacist called the police who then arrested Winston. His bail is set at $2,500. Angela Morell, 32, is wanted by the Clarkstown Police for Criminal Possession of a Controlled Substance. She is 5’6 and her last address was in Lagrange, Georgia. If you have any information, the Clarkstown Police would like you to contact them at (845) 639-5880.